Culinary Arts Program Bakes 1500 Cookies for "Run for the Wall" Veterans! 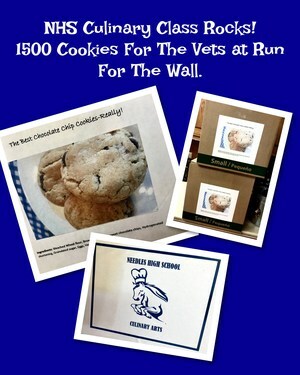 Needles High School Culinary Arts students bake 1500 cookies for today's "Run for the Wall" event at the El Garces! Thank you to Teacher Linda Patterson and all Culinary Arts Students for your hard work!!!! !